It might be surprising to see Kemba Walker leading the league in passes, followed by some familiar names. However, despite averaging the most passes per game, Walker is nowhere near the league-leaders in Points Created by Assist per Game – averaging 11.7 points to Chris Paul’s 25.3. The question arises as a result: between Kemba Walker and Chris Paul, who is the more effective passer (whether due to personal skill, quality of teammates, offensive scheme, or other factors)? We can get a very simple picture of the effectiveness of a player’s passing by dividing their Points Created by Assist per Game by their Passes per Game, to find their Passing Efficiency. Why take both points created and passes into account? Why not just read a list of the players creating the most points per game? This way, we can see who some of the most important offensive cogs in the league are by leveling the field. Chris Paul leads the league in points catalyzed by passing, but also gets a huge amount of opportunities to do so (he is currently third in the league in touches per game, per SportVU). On the other side of the spectrum, there may be players that have much smaller roles on their teams, but are executing extremely well and efficiency given their limited roles. This isn’t to insinuate that any old bench player could put up 10+ assists given the near-100 touches a game that Paul receives, but we can see some of the most efficient playmakers in the league are, regardless of their respective roles. We will also calculate the league average by averaging the points created and the number of passes of players who have played more than 20 games this season and notch more than 15 minutes per game. (Note: this method is non-position specific. It may be unfair to compare a guy like Rajon Rondo to a guy like Nikola Pekovic. This may be revisited). Finally, we divide the players points per pass by the league average (>20 GP, >15 MPG) to find a percentage value of how effective a player’s passes are versus a statistically average player. This give us Passing Efficiency Versus Replacement (PEVR). 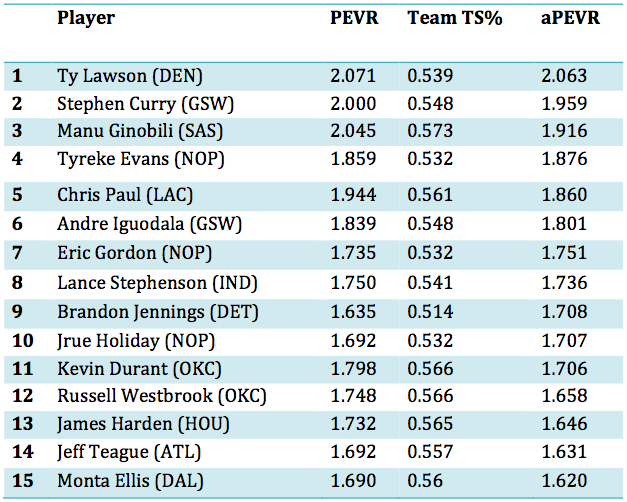 *Disclaimer: This should not be seen as a “leaderboard,” as many of these values are virtually and practically identical (Lawson’s 0.368 points per pass vs. Ginobili’s 0.363). Consider this more of a list of skilled players on good teams that are a good fit for them. Statistically, Ty Lawson and Stephen Curry have been producing more points in less passes than Chris Paul by a fair margin, who is leading the league in assists by a huge gap (11.2 to second place Curry’s 9.1). So, why all the praise over Curry’s improved playmaking ability when his team got even better over the offseason? Lawson’s team lost two of their arguably best players (Gallinari to injury and Iguodala to Curry’s team) and his numbers have increased. And not just his points, as to be expected when playing on a worse team, but his assists per game have actually gone up from 6.9 to 8.8. Ty is balling. Kevin Durant and LeBron, our two leaders in the MVP race, are sitting virtually equal. It must be nice to be good at everything. Unsurprisingly, Chris Paul is near the top of the list. What’s more impressive is that he is doing so while being the only player in the top 15 with more than 70 passes per game (and one of two players with more than 60 passes per game, along with Jrue Holiday at 60.6). Compared to his competition, he is making way more plays and doing so at a highly efficient rate. Manu and Tyreke are somewhat suspicious at first glance. It turns out that they are producing some very efficient numbers, both are producing more than 4 APG with less than 30 passes per game. 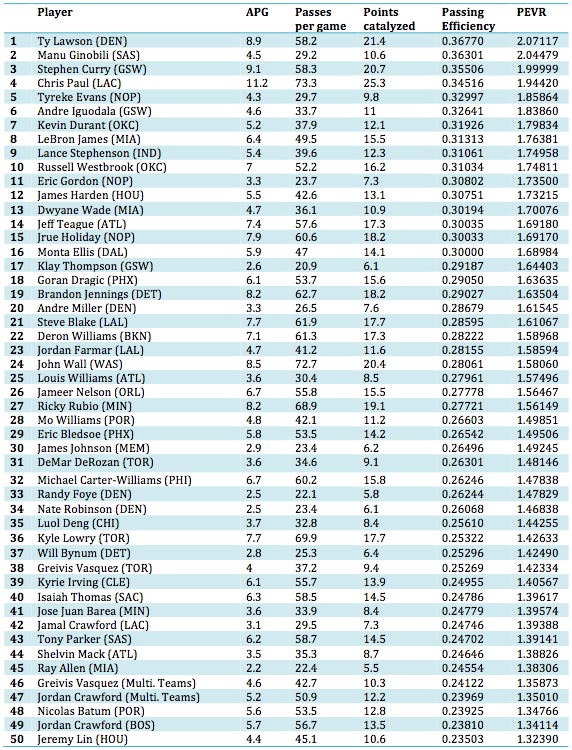 Speaking of Tyreke, there are three Pelicans teammates in the top 20 (Evans, Gordon, and Holiday). Are these guys all great playmakers, or are they simultaneously benefitting from playing with each other, as they are all capable scorers. Having the opportunity to play pick and roll with Anthony Davis helps too. More on this in a moment. This chart begs the question: which players are benefitting by playing with better teammates, and who is doing more with less? Is Ginobili really among the best passers in the league, or does he benefit highly from playing on the consistently efficient offense of the Spurs? Do the Pelicans’ players all have the luxury of playing on a team boasting the best offensive line-up in the league, when Ryan Anderson was on the floor? I want to preface this section by stressing that you should take it with a grain of salt, and again, I encourage you to view this as a flexible list rather than a leaderboard. The reason I say this, is because the best passers find their teammates for open looks and easy shots, and as a result raise the efficiency of their offense overall. When you look at a player like Chris Paul, LeBron James, or Kevin Durant, you see that their teams at among the tops of the league in PPG and FG%, due in no small part to their contributions. So should we punish them for constructing effective offenses with ridiculous efficiency? Probably not. But should we compensate players who are stuck playing on teams with bad management and/or bad teammates? Definitely. The metric that we use to adjust PEVR are teams’ True Shooting Percentages (TS%). TS% takes points, field goals attempts, and free throws attempted to determine how efficiently a team achieves the amount of points that they score. The Heat, Spurs and Thunder are leading the league in TS% (scoring lots of points and doing it well), while the Bucks and Cavs own the league’s lowest marks. To read more, here is a nice explanation of TS%. In addition, you can view the entire league’s TS% marks here. The league average for TS% is 0.537. This adjustment is fairly erratic, our top five features the same players in a different order, while other players caught huge shifts in their positioning. This is a testament to how close the numbers for Passing Efficiency really are though. 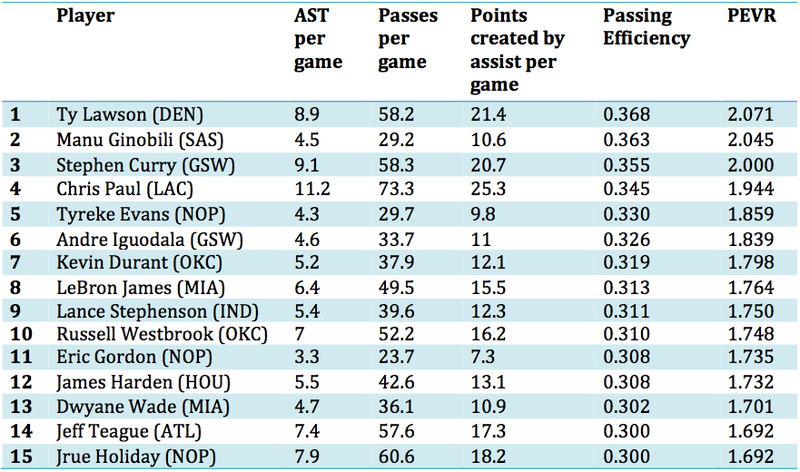 Durant is the last true forward in the top ten (!!! ), depending on how you define swingmen Iguodala and Evans. How can you even guard a pick and roll between Durant and Ibaka with Ibaka’s smooth midrange game? LeBron drops to 24th, with an aPEVR of 158.6%. Does this mean that there are 23 players in the league that could make Miami’s offense more efficient? Obviously not. This is an example of a player being penalized for engineering a hyper-efficient offense, with the Heat posting a 0.597 TS% (compared to second place Spurs’ 0.571). Why doesn’t Ty Lawson get more attention? Third in the league in assists, on a team where the next best player is probably the limited Kenneth Faried. Steph Curry is no slouch either, and he can be a force for years to come if he can avoid injury (putting up 9 APG this year and liable to shoot 45% from deep. Ouch). By investigating PEVR, I feel that I learned a bit more about the depth that lies behind the simplicity of Assists per Game. Ty Lawson and Steph Curry may be overshadowed by Chris Paul’s gaudy stats, but neither holds the ball as much as Paul does. The Clippers may be functioning well in his absence, but when Paul is on the floor, he is always in the driver’s seat. Paul is a once-in-a-generation talent, and I find it extremely impressive that these two guys are hanging with him, despite not being common names in talks about the top point guards in the league. Not to mention our secondary ball-handlers performing well too, Manu and Tyreke are efficiently running offenses as well. If nothing else, it’s refreshing to see a list of forgotten and glossed-over players showing that they deserve a bit more recognition. FTCreated is a SportVU statistic that can be found on NBA.com. Ast% can be found on basketball-reference.com. This essentially determines the number of FTs taken while the player was on the floor, on average, and assumes that they assisted on the same percentage of FGs and FTs. Special thanks to stats.nba.com and basketball-reference.com for the statistics used in this article. The link for the TS% shows the formula to be Points / (2 * (FGA + 0.44 * FTA)). I have seen this a few times but have never seen anyone able to explain how the .44 coefficient was derived. Any clues as to how the .44 came about or what variables were used to arrive at .44 ? Doing a bit of research it seems that 0.44 is a somewhat arbitrary value that may be outdated now, but it does hold significance. The 0.44 value is indicative of the league average value for free throws that take up a full possession; that is to say that it takes out the free throws that come from technicals and and-1s. The true, league average value is closer to 88%, but it is halved due to players taking two shots on one free throw (this number also apparently takes into account any fouls on three point attempts, so it won’t exactly be 88%). As such, the 0.44 number is somewhat inaccurate when calculating TS% for a single player over a small game size, especially if they are not shooting technicals for the team or drawing and-1s (then 100% of their free throws are taking up full possessions). However, for larger samples like entire teams over the course of a season, it is much more accurate, and the discrepancy between the 0.44 value and the “true” value would be much smaller. By adding FGA and the FTA (multiplied by the 0.44 coefficient) you have the number of possessions that a player shot the ball. The coefficient of 2 on that quantity yields the expected number of points from each FGA, 2 points per 1 attempt, and brings the 0.44 value back up to the true value around 0.88 (a bit counterintuitive). TS% calculates the points scored divided by the expected number of points scored by possessions, if all shots fell. Last thought: how does this account for threes, if it uses only FGA? If a player were to score on all threes, their points scored would outpace the expected number of points scored (the formula expects 2 points on every 1 attempt), resulting in a heavier numerator, and bringing the entire value up. Shouldn’t the TS% for aPEVR exclude the actual player’s TS% and implicit FG/FGA numbers, so that all of the teammates’ data remains? I mean, they can’t assist themselves. That makes more sense to me. Great find, you’re absolutely right. I was checking out your own work and I appreciate your tangential work, I’m glad you found it interesting enough to pursue you’re own take on it. Curious if this type of stat would ever translate to the European basketball landscape? There is little to no SportsVU data there but wondering if there are advanced stats that can be worked on at all?